ST mahamandal is the only public transport corporation in the state of maharasthra. ST mahamandal formally known as MSRTC which is stands for Maharashtra State Road Transport Corporation. ST mahamandal have offices and regions to provide quality services all over the state of Maharashtra. Divisions such as Mumbai region, pune region, nashik region etc. Maharashtra have 36 districts among all of districts have their regional offices and ST bus depots. Shivneri bus is the luxury bus and remains in the top list of MSRTC bus fleet. Shivneri buses are well known for its quality traveling experience with superior interior designs and comfortable seats. shivneri bus service available in Volvo bus. This type of buses have luxury in nature and superior engineering design. The important part of these buses is the suspension system, it is way better than ordinary public transport vehicles. The shivneri fare ticket is little expensive than other MSRTC buses because of its luxury traveling. But the fare ticket worth of it for such nice traveling. Shivshahi bus is the new semi luxury bus series, MSRTC launched shivshahi bus earlier in 2016. Shivshahi bus is the special in every way because these buses have in collaboration with private bus owners. 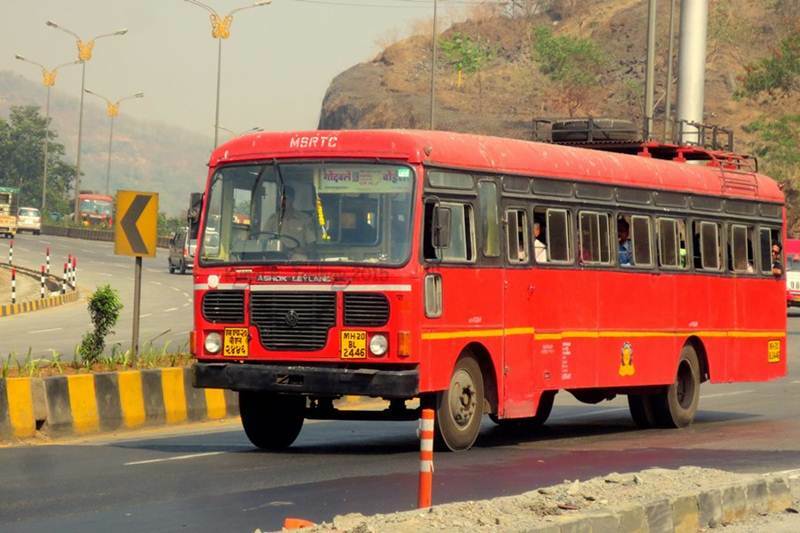 MSRTC wants to improve the quality of traveling experience. shivshahi bus playing a important role to managing the bus ticket price of shivneri and other MSRTC buses. shivshahi bus ticket is little higher than hirkani bus/ non AC MSRTC bus, but cheaper than shivneri bus. so MSRTC wants to provide options to all type of passengers according to their budget. ST mahamandal bus have many attachments with all peoples of maharashtra, from rural areas to modern/ sophisticated areas of current societies like Mumbai, pune or Nashik. This fleet of MSRTC buses have won the hearts of million peoples of Maharashtra. This is the lifeline of Maharashtra public transport, almost every people had travel with ST mahamandal buses because of strong bus network. this bus is also famous in other names like “lal dabba”. If you ever traveled with ST bus (Red bus), Please give your comments on this fleet of MSRTC buses and how was your experience with it. Some of our friends will say now this buses are too old and doesn’t feel good to travel with. But as a fan of this bus I would like to say that I have lots of attachments and emotions with these buses from my school days, office days, vacation / festivals at every point ST bus is there for me, even at night. ST bus will be there for you at every stage.